In vibrant prose, Z. Vance Wilson offers insight to anyone, whether parent or teacher, responsible for guiding children on the joyous, difficult, and ever-unpredictable path to becoming their best selves intellectually, socially, morally, and spiritually. With judiciousness, good will, and humor (all sharpened as head of a leading boys school in Washington, D.C.), Wilson puts forth a clear set of … principles, both practical and idealistic, for adults directing children toward wisdom and joy. 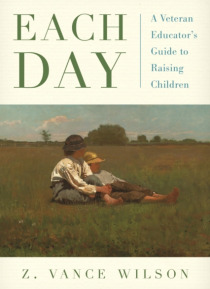 An award-winning novelist, Wilson draws on colorful tales from his childhood in the American south, rousing episodes in history, and a remarkable assortment of poems, novels, and biblical readings, to illustrate the challenges children face and to illuminate the ways adults may best reach and teach them.